I spoke to Berta Cáceres the day she was murdered. I never imagined that later this year I would be in a demonstration along with almost a thousand women in Honduras asking for justice for her murder. Sometimes, I still can hear her voice and this reality of having her gone forever feels like a dream. Nine months have passed already since she was murdered, and by now the world knows all about Berta Cáceres. Just as we know how The Mirabal sisters fought against the regime controlled by a cruel dictator, Rafael Trujillo, in the Dominican Republic, and were killed on government orders on November 25th 1960. This is the reason why we commemorate that date every year around the world as the International Day for the Elimination of Violence Against Women. Berta was an extraordinary feminist, environmental activist, and indigenous leader among the Lenca people in Honduras. She was a brilliant organizer and strategist, a firm and inspiring teacher, and a true internacionalista. Berta recognized how the Lenca communities’ struggle to protect their land and rivers was a global struggle, and at the same time she knew how to sow the love in her struggle in the heart of each person that she was involved with. For more than a decade, the Council of Popular and Indigenous Organizations of Honduras (COPINH) - the community-based movement she co-led, organized one community after another, building a network among 200 Lenca communities with allies across Honduras and in every part of the world. It is this movement that is giving us the hope that our future can be different. One of these communities fought for years against the construction of the Agua Zarca Dam, a hydroelectric project that would have destroyed water resources, livelihoods and displaced the community. Berta always knew they would win their fight to save the river, the river itself told her so. That was how COPINH, along with Rio Blanco people, managed to throw out a huge Chiñese company. After the 2009 coup in Honduras, Berta received dozens of threats for her activism, particularly in defense of the land and natural resources in Lenca territory when it seemed that every inch would be auctioned off (there are 49 concessions on their land today). On March 2, she was killed for her defense of the river Gualcarque. And she’s not the only one. Honduras is the most dangerous country in the world for environmental activists, according to Global Witness. Between 2010 and 2015, 109 people were killed there for taking a stand against destructive dams, mining, logging, or agricultural projects. Of the eight people whose deaths were reported in 2015, six were indigenous leaders. I met Berta and COPINH when I was a teenager, and from 2011 onwards I worked closely with her and other compitas to support their struggles, and to create and activate her security and protection plan, while JASS and many other allies built the National Women Human Rights Defenders Network in Honduras, and the Mesoamerican Women Human Rights Defenders Initiative (known for its Spanish acronym, IMD). The IMD is a collaborative effort of six organizations that develops feminist movement-building strategies to address the specific forms of violence, stigma and sexism that women human rights defenders face. Berta survived every imaginable threat and harassment – that she would be raped and killed, and that her children would be raped and killed. In 2012, while organizing protests against the proposed dam on the Rio Gualcarque in the Lenca community of Rio Blanco, Berta was picked up by a police truck, framed and taken into custody, and charged with illegal possession of weapons. Aware that she was in danger of being killed or “disappeared,” she called us, activating the network. Within hours, all of Honduras and more than 150 international and Latin American organizations began calling the Chief of Police demanding her release. After just two days, she was allowed to go home, although the charges remained. We fought the legal battle but she was never really safe. New accusations, charges of criminal behavior and slander about her personal relationships and her role as a mother became public. It was difficult for her, but her commitment to life, to saving the river, and to human rights activism never wavered. Nor did the attacks against her, right up until the time of her murder. When I first heard that this leader: my friend, my teacher, one of my political guides was assassinated, I didn’t believe it. In fact, I was not able to cry until I was coming home from the second demonstration mobilized to denounce her murder. I saw graffiti—Berta Vive—on a wall with her face, right there in front of me, and I burst into tears. I used to wonder, if they can kill a high-profile activist like her, what does that mean for the rest of us, for the thousands of other activists in Honduras who put their lives on the line every day to demand justice and respect for people’s rights and to protect the planet? Today, in this demonstration, nine months later, I undestand... her voice has become millions! Her assassination will never be forgotten, just like the Mirabal sisters who opposed the dictatorship they were living under, were assassinated for their activism, and became symbols of of both popular and feminist resistance. In this century when we are facing a global dictatorship performed by different actors, Berta embodies three different resistances: anti-patriarchal, anti-racist and anti-capitalist. Because Berta was one of Honduras’ most recognized human rights defenders, her murder captured worldwide attention, even in a country as violent as ours. In 2015, she received the prestigious Goldman Environmental Prize which honors grassroots activists. She and COPINH have many allies around the world because of their active involvement on so many issues that are important to indigenous peoples and to Honduras. The power of her story, and the vast networks tied to her and COPINH unleashed an explosion of activism after her murder, mobilizing environmentalists, feminists, indigenous rights leaders, and human rights advocates around the world, who are still calling - in a loud collective voice today - for those responsible to be held accountable, and for an end to construction of dams and other projects that threaten people's lives. Two weeks after her murder, JASS worked with many international groups and donors to pull together a delegation of Honduran women defenders to the U.N. Commission on the Status of Women. The delegation, which included the co-coordinator of COPINH, was led by Bertha Zúniga Cáceres, Berta’s daughter, who testified before the plenary on March 18. In her testimony, Bertha Cáceres called for the creation of an independent expert group supported by the Inter-American Commission on Human Rights to investigate her mother’s murder, and for the Honduran government to take steps to end a culture of impunity. She received a standing ovation. The trip to New York was the first international visit led by Bertha Cáceres, COPINH, and other Honduran justice leaders. Since then, there have been two other delegations to the US and a full tour of Europe. Five men have been charged with Cáceres’ murder, including a mid-level employee of Desarollos Energéticos (DESA), the Honduran company leading the dam project. Despite our best efforts, Cáceres couldn’t be protected at all times. But people who work to protect the environment and their communities shouldn’t need protection. The Honduran government must come clean about its role in the systematic persecution of indigenous and environmental leaders under its watch. 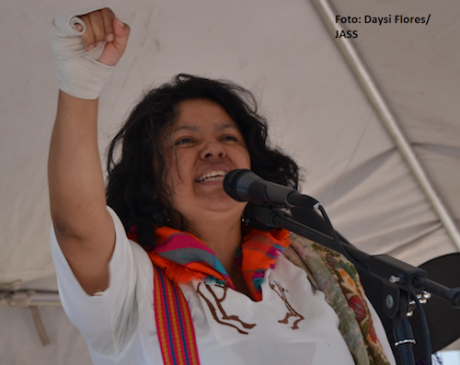 The murder of Berta Cáceres, and other members of COPINH, has provoked an enormous international solidarity response and a push for justice around the world, while also bringing to the forefront the responsibility of governments, banks, and corporations in human rights violations against communities that defend territories and natural resources. Based on JASS’s experience accompanying COPINH and Berta’s family, we experience the continuous violations against the Lenca community and women human rights defenders in Honduras, and the power of international solidarity. 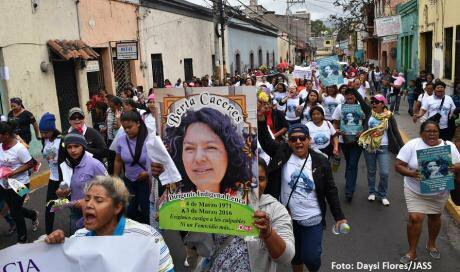 Nine months later, the search for justice has not gone cold dispite of the robbery of the case file on Berta Cáceres’ assassination, and the poor results on her case. Numerous human rights groups, both in Honduras and internationally, have called for an independent investigation. 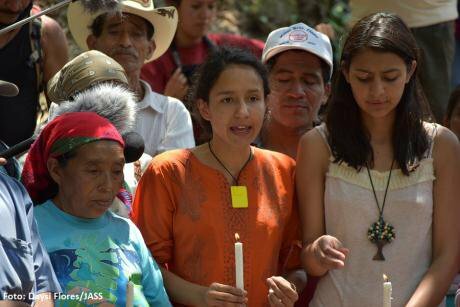 Berta´s daugthers, friends, and organizations have been tireless demanding justice for her and all Human Rights Defenders who face different kind of threats - including death - just for doing what they have the right to do. That is why we have all welcomed the creation of an International Experts Advisory Group (GAIPE) to support and pursue the investigation of the murder of Berta Cáceres Flores, and the attempted murder of human rights defender, Gustavo Castro Soto. Read more articles on openDemocracy 50,50 in this year's 16 Days: Activism Against Gender-Based Violence.